Note: Todays combined HQ and Krav Maga session is an “Old School” original CrossFit HQ workout programmed by Coach Glassman. The combination of the heavy Front Squat and Toes to Bar provides a potent midsection stimulus. 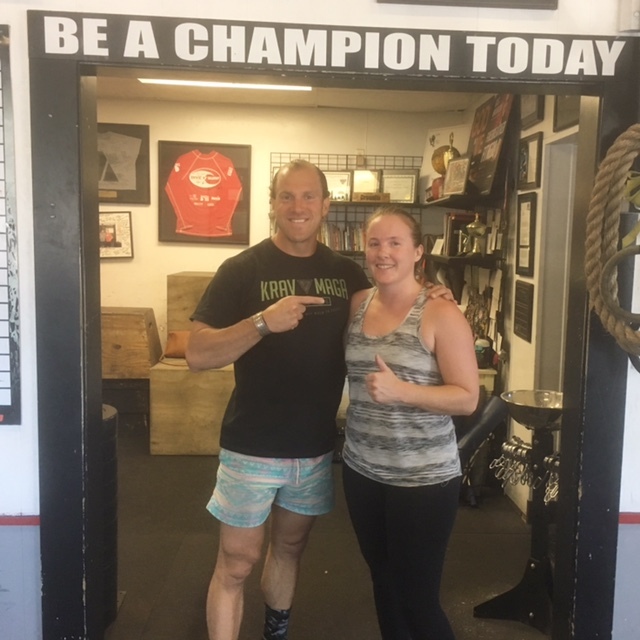 Congratulations to Margaret who was recognized as Athlete Of The Week at CrossFit Amundson. Margaret is an official “Trifecta Athlete” who participates in our CrossFit, Yoga and now Krav Maga programs, all with resounding success. Margaret had never done a martial arts class in her life, yet by her performance in Krav Maga, you would never know that to be the case! Margaret has the mindset of a champion, and approaches workouts and challenges with a super optimistic and “I can overcome” attitude. In addition to her CrossFit physical capacity, her mobility in Yoga, and power in Krav Maga, has been awesome to behold. Margaret has a smile than can light up the room (and the gym) and is quick with a kind word. Congratulations Margaret on all your success both inside and outside the gym, and keep up the inspiring work!